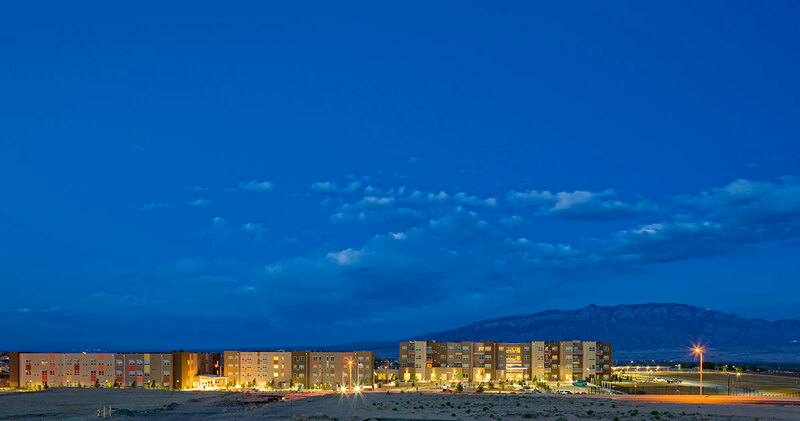 The Neighborhood in Rio Rancho is a multi-purpose adult living community, intended to create a living environment that encourages intellectual, social, physical, and spiritual wellness for area seniors. The goal is to serve seniors by providing support services and much needed residential, communal, and recreational space for the aging senior population. The multi-story building is being designed in two phases, with approximately 275,000 square feet in Phase one, and 175,000 square feet in Phase two. The project is designed to include 225 Independent Living Units, 78 Assisted Living Units, 24 Memory Care, and 48 Nursing Beds. Aside from the residential units, common areas, such as a fitness center with an indoor pool and spa, business center, kitchen and dining room, reception area, meeting room, activity room, and administrative offices, are included in the project. Shuttle services will be provided to the residents for shopping and other appointments. The site is amply landscaped with plant materials appropriate for the region, and are sited to maintain views to the Sandias, while also providing adequate buffering and screening where appropriate.